October 9, 2018 — Comments are off for this post. Let's be honest; SEO is challenging. From link building to on-page and technical SEO, you have to get the fundamentals of SEO perfect to see any results. However, there are some SEO low hanging fruit that you can implement yourself – in just an hour. One area to pay extra-close attention to is Google My Business. Without a well-optimized GMB listing, your chances of appearing in Google features, like the Local Pack and Maps are going to be slim to none. This seems like common sense, but nothing can screw your business over more, than having the wrong info on there. Whenever setting up a GMB account, make sure you fill in as much info as possible and making sure everything is correct. Now, when I say make sure everything is correct, I mean everything. So, put in the basics like address, phone number and hours of operation. After that, it is critical that all the information across your platforms is uniform. Google is very specific in their algorithm, so everything has to match exactly. If you have your address as 91 Tycos Dr. on your GMB page, but your website says 91 Tycos Drive, you need to change the website so it matches GMB. Even more so, if your GMB page says Tycos Dr., but your website just says Tycos Dr, make sure you add the period. If you’ve done this correctly, all your accurate business details should be in your profile. Make sure you have uploaded multiple photos to make your business look vibrant and engaging, and now you’re ready for consumers to see your business! GMB offers a wide range of features in order to help you maximize your business, some of which have just been added within the last few months. Many owners are either unaware of these features, or are not utilizing them to their full potential. One example of this is Google Reviews. Some people may not see value in asking for a review, which is an obvious pitfall. However, some may recognize the importance of a review, and ask for one, but take no action after receiving one. It’s always important to reply to your customer, as it shows that you are attentive and care about your customers. With that said, you should only use the options that fit your business. For example, GMB allows you to add a service menu so consumers can see all the options before arriving. Naturally, this would apply to restaurants, or establishments that have multiple pricing options; such as a hairdresser or electrician. However, someone running a dog walking business should probably skip having a menu (unless they offer special rates for Labradors vs Pugs). Having a good understanding of all of these tools will go a long way when managing local SEO. When thinking about local SEO, always remember, it’s easy to do, but it’s hard to do well. Once you’ve built your GMB page, you’re done right? NOPE. there's so much more you can do. One of the next major things you'll want to focus on is your ranking. Ranking determines how quickly you appear on Google when consumers are searching your industry. It’s one thing to present well when someone Googles you. However, it’s an entirely different beast when you want to be found when someone is doing a general search. So, now the big question: How do you get a high ranking? 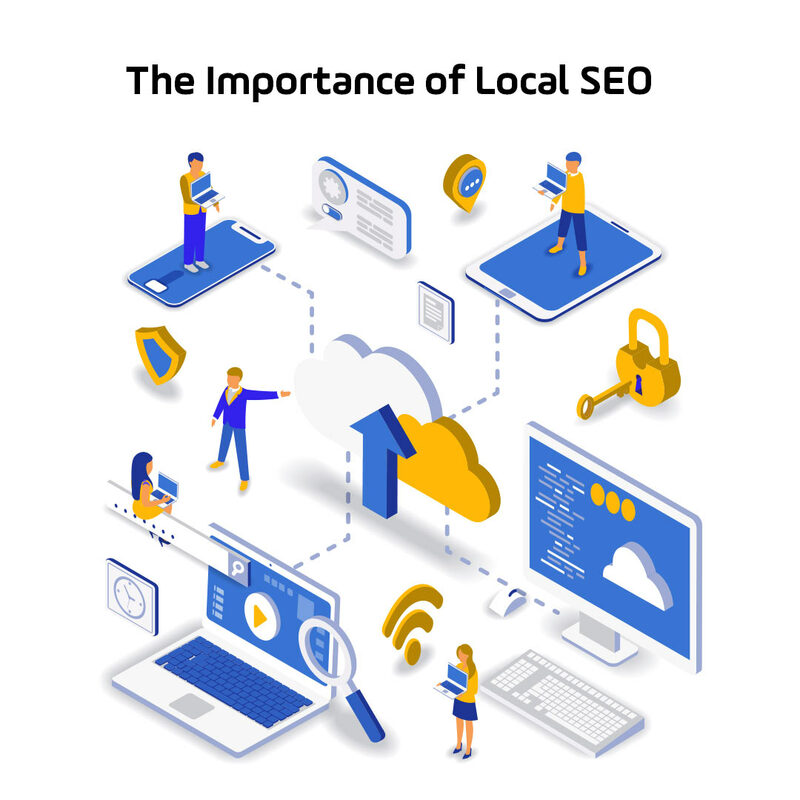 One way to help achieve this, is to recognize three major factors of local SEO: GMB Optimization, Citation Building, and Page Content. GMB Optimization refers to taking your GMB page, utilizing all the tools that we previously mentioned, and going even further – beyond what the average business would think of. In essence, you’re trying to give Google as many reasons as possible to see your page and populate it to as many people as possible. There are three great ways to do this. The first is to select multiple categories for your business on the GMB dashboard, so that your business appears in multiple searches. The second is to add Geo-tagged photos to your GMB page so that your proximity becomes more apparent to Google. This pushes you to the top of the searches in the Geo-tagged areas. The third is reviews, as having multiple five star reviews can help push your page to the top of organic searches. Citations refer to anywhere online that refers to your NAP (Name, address, phone number). Going back to discussing previously, about having your website and GMB page containing exactly the same contact info. This must be the case across any page that has your NAP in order to maximize your ranking. There are tools online for checking this; such as moz.com. Finally, we have Page Content. This is exactly what it sounds like - the stuff on your website. The content that generates the higher ranking for Google is anything that aligns with your GMB page. By doing this, you confirm to Google that your website and your GMB page are aligned with each other; essentially verifying the content. This can include your NAP, hours of operation, or key words referring to your business category. GMB offers a fantastic resource that dives into your business' analytics, called 'Insights'. They are incredibly helpful and can show you where changes need to be made in your local SEO and how to do it. Firstly, it shows you what actions consumers took in relation to your business. Such as visits to your site, phone calls, and direction requests. Secondly, they offer subjective attributes in order to get a sense of how your business is perceived. Thirdly, and possibly the most important one, is the analytics comparing your business to competitors. Insights will analyze your business, and compare aspects such as photo quantity, and advise where you need to take action. Data like this can prove critical to businesses, as it acknowledges the strengths of your business, helps identify gaps to plug, and ultimately helps take your business to the next level. With the ability to essentially look up anything online, very few decisions are made these days without looking at an online review first. As a result, reviews have become one of the most influential things in business. However, as mentioned before; Google reviews have additional influence, as they can affect your local SEO ranking. The tricky part here is that there is an art and a science to getting reviews. Naturally, consumers are going to gravitate towards a business that has a higher star ranking than its competitors. However, in the case of two rival businesses that have a similar star rating, consumers will more likely gravitate to the one with more reviews, as that can serve as a tiebreaker. We’ve touched on replying to your reviews through GMB, but the question is, how do you get reviews? The first step is make it as easy as possible. When trying to generate reviews, you want to remove as many hurdles as you can; the harder it is for someone to leave a review, the less likely they are to do it. The easiest way to do this is to use a site like whitespark.com, which will generate a custom link for you. This link will take anyone who types it directly, into a page where you can leave a review for your business. It is recommended that you only share this link with consumers who you know have had a positive experience with you, as opposed to embedding the link on your website and leaving it available to everyone. The second step is understanding how to ask for reviews. There is a psychology to asking customers for a review, as some people may view it as an imposition. The good news is that there are two great tricks to asking for a review that have a high success rate. The first one is to give a reason as to why the review is important. Studies show that giving a reason, in addition to a request will increase your chances of success dramatically. Even a reason as simple as “it would really help us”, could make all the difference. The second trick is to ask for a review right after the customer has given you a compliment. By doing this, you are putting yourself in the best position for a yes, as they are clearly in a positive frame of mind about you and your business. The reality is, asking for reviews can feel very awkward. Some people are naturally great at it, others need to learn to do it. The fact of the matter is that asking for reviews can be critical to any business’ growth, so once you’ve mastered this skill; the sky's the limit. We’ve covered a lot here. If you’ve read this whole thing kudos to you! For real. In this industry, we have many tools at our disposal in order to help our clients succeed. They come to us because they recognize our talent and they want to utilize that in order to help their business grow. As a result, it’s on us as advertisers to have a rock solid understanding of these tools, in order to not only deliver incredible client service, but to help them recognize other avenues that they haven’t explored yet. This is just the tip of the iceberg, but the good news is, that when you go to a restaurant, they always say a good tip is 18%. Desire paths. Whether you are aware of them or not, you see them all the time. A dirt path bisects a patch of grass, cutting the corner between a 90º turn in a sidewalk. Not only have we seen them, we most often use these worn paths since everything points to the fact that they are the more efficient way to go. Much to the chagrin of the urban planner, this newly defined path is a natural reaction to a fabricated situation. And it can’t be ignored. In fact, a good urban planner would see this as insight and pave that new, informed sidewalk since user experience has trumped design. It’s so important for marketers to recognize any new pathways created by the interactions their customers have with a given product or service and adapt accordingly. Nature has its way of discovering the path of least resistance. Humans usually pick the quickest way. To our natural benefit, we are a bit lazy. Rats certainly are good at shortcuts. Hell, even water takes the shortest, most efficient route. This happens in the sales cycle as well. You can open a store, or create a e-commerce site or develop a brilliant crafted marketing campaign aimed at capturing sales leads. But what if you were able to see the paths that customers ACTUALLY took to enter your store, or where they left your website or how many actually filled out your form that has a few too many boxes to fill. It’s so important for marketers to recognize any new pathways created by the interactions their customers have with a given product or service and adapt accordingly. But how do we see those pathways when they aren’t as obvious as a path of worn-down grass? One word: data. It’s no secret that data is invaluable. But sometimes you need to find a way to see the invisible to discover the value. It is said that urban planners in Finland use a unique way of understanding how pedestrians interact with a particular city: they wait for a snowfall and study the footpaths that are created once the paved sidewalks have disappeared. Once the “suggested” route is gone, new pathways emerge — because as a new building arises or an old bus stop is removed, the environment intrinsically changes, whereas the sidewalks do not. It's no secret that data is invaluable. But sometimes you need to find a way to see the invisible to discover the value. The University of Berkeley was said to have developed part of their campus without pathways and allowed the natural flow of people (and their grass-trampling tendencies) to illustrate where the paved paths should go. It seems so simple. But without the data surely they would never have mapped the campus better than time did. And that's where the data comes in for marketers. You've got it. Use it. Find those desire paths that emerge from it. The answers are there. You just have to learn how to see the path that is right before your eyes and pave it for your customer. Without knowing it, they are telling you how to make their experience better. 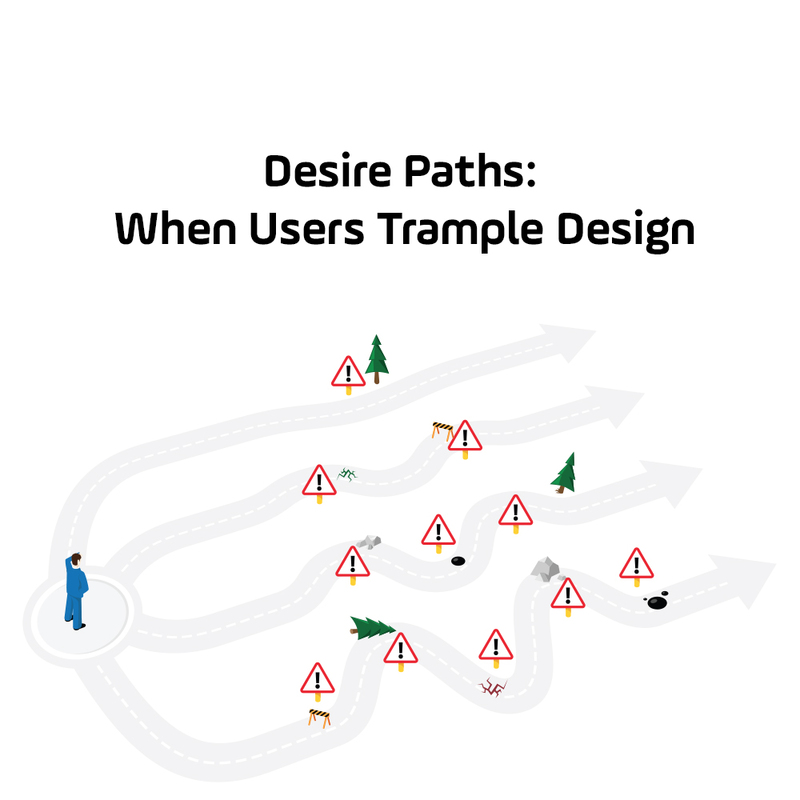 Let those desire paths lead the way. June 26, 2018 — Comments are off for this post. A word to the wise email marketer: Don’t hide your unsubscribe link. Make it BOLD. Make it stand out. It will help you target the actual customers you want to speak to. As a marketer, I understand the power of an email subscriber list. But what I also understand is the difference between a large subscriber list and a qualified subscriber list. These are two very different things. Quantity doesn't mean quality. Ever since the introduction of the Canadian Anti-Spam Legislation (CASL) in 2014, email marketing has become a far more viable way to engage customers. I never thought I’d say it, but it has. What is CASL? It’s a law that states companies can’t try to sell you something via email without your permission. In other words, they can’t spam you. This is good. There is nothing wrong with email marketing, assuming the emails are going to the right people. I work at an agency that sends out a lot of email marketing. We manage hundreds of thousands of email addresses across hundreds of different lists. At the end of the day, I don’t want to go home thinking that I’ve spammed a bunch of people. And you know what? I never feel that way. Part of the reason has to do with the “Unsubscribe” link on our emails. I actually feel good when someone unsubscribes because I know my email subscriber list just became more targeted. I don’t want to bother people by filling their inbox with stuff they don’t want. Let me explain. For one client, we send out weekly emails to a list that is just shy of 100,000 addresses. 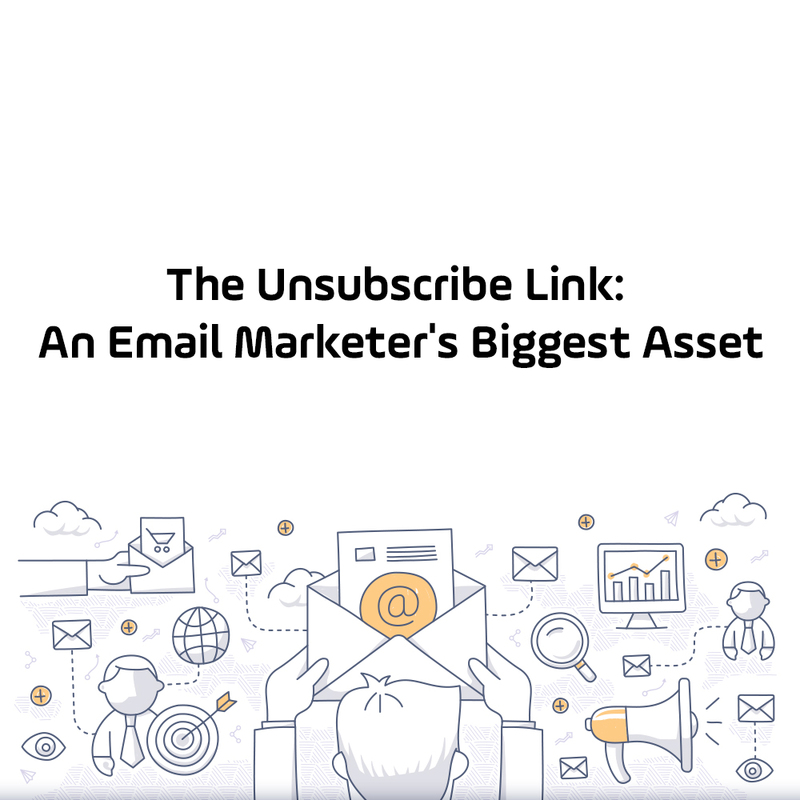 We gain about 750 addresses per week and, with each email, about 500 people unsubscribe. “500 customers unsubscribe? !” exclaims someone who doesn’t exist. Yes, 500. That may seem like a lot but when you think that it’s only 0.5% of the list it suddenly isn’t so bad. And think, there are 99,500 people who DIDN'T unsubscribe and don’t mind if I send them an email next week. There is nothing wrong with email marketing, assuming the emails are going to the right people. When it comes to unsubscribers receiving an unwanted email, I imagine each one of them walking into a pet store when they meant to walk into a shoe store. They're in the wrong place. They don’t want to be there. They don’t own (or even want to own) a pet. The pet store employee may be nice but they are going to have one hell of a time satisfying that errant shoe shopper. The unsubscriber either ended up on the list by mistake or they simply don’t want what we are selling. And that’s ok! All the best, Unsubscriber Person, I hope you find a nice pair of shoes! Now let’s sell some parakeets to some people who are looking for parakeets! Fact is, as long as you are delivering credible information that is genuinely valuable to your customers, you shouldn’t have to worry about showing your unsubscribe link to the world. With a more potent list, your click-through rates will be higher, leading to higher conversions and bigger numbers to show your clients. Don’t try to elude the person who wants to unsubscribe from your marketing emails. Unsubscribers only clear the path to true, engaged customers and make your qualified subscriber list a more powerful tool than ever. May 4, 2018 — Comments are off for this post. Facebook held their annual F8 conference on Tuesday and Wednesday of this week and let the cat out of the bag on some Instagram goodness. 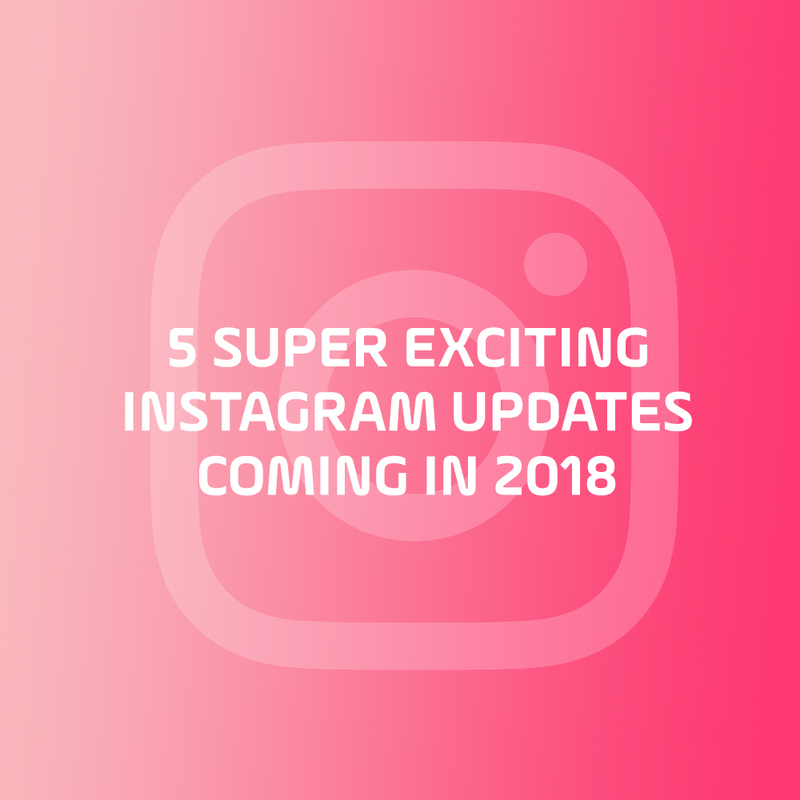 Instagram has become such a large and powerful platform over the last 5 years and it’s about to get more feature rich and popular than ever. Purists may argue that these features will be the downfall of IG and that it’s losing the core of what made it so special, but we disagree. Either way that’s not the point of this article, so let's get into the meat of it. The highly sought after explore page that can skyrocket the following of an account is totally redesigned and will now allow users to browse content interests via a “channels” feature. The channels will be based on your personal tastes and likes, rather than the IG algorithm so you the user will be able to choose the content that you wish to engage with - be it “sports”, “Garyvee” or “star wars toys of the 80’s”. 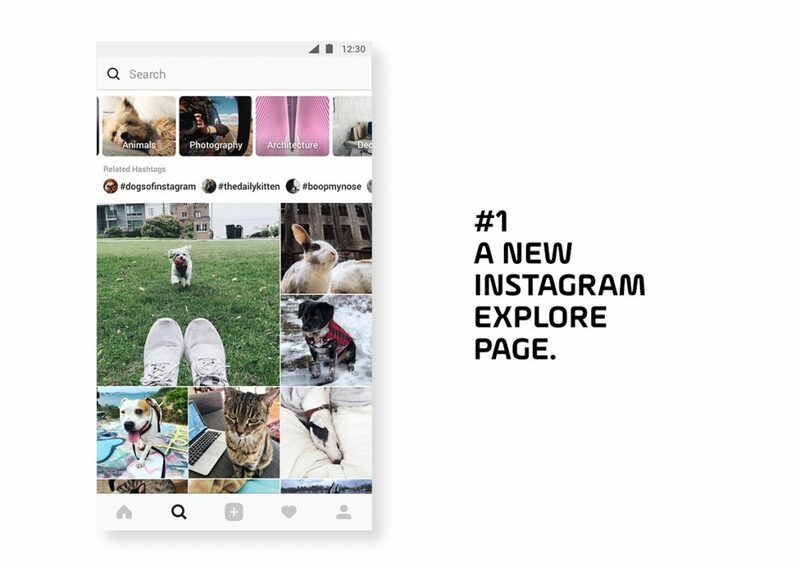 It's also expected that the new explore page will also make it easier for users to find and interact with you business on Instagram. One can only presume this will involve the FB / Instagram MarTech. According to Instagram the new Explore page will be rolling out over the coming weeks. According to the company’s internal research more than 100 Million Instagram users watch or share on Live every day and according to the data more and more want the real time video experience in smaller groups. Enter the Video Group Chat feature. Side note this will be a feature coming to the Facebook owned WhatsApp as well. 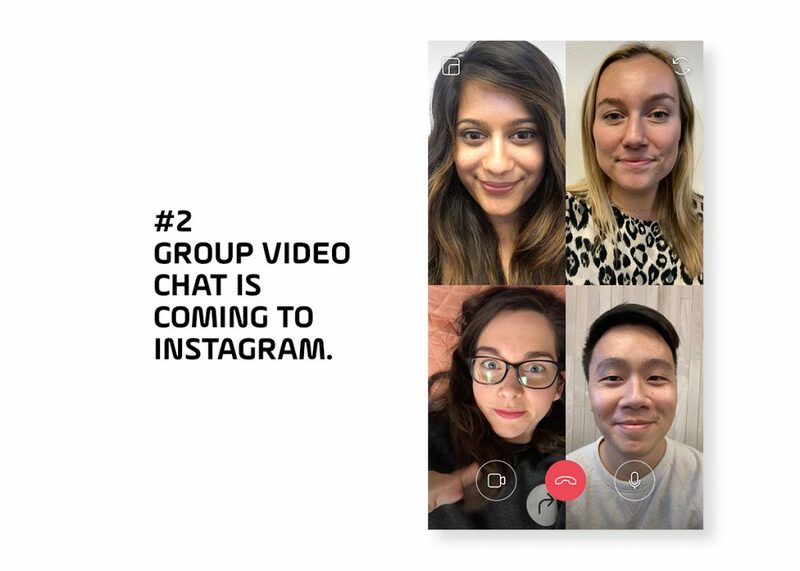 Video chat will be available in Instagram Direct and will work for one-on-one and group conversations. AR is everywhere, hey we even built it into the Pizzaville mobile app we designed - shameless plug. 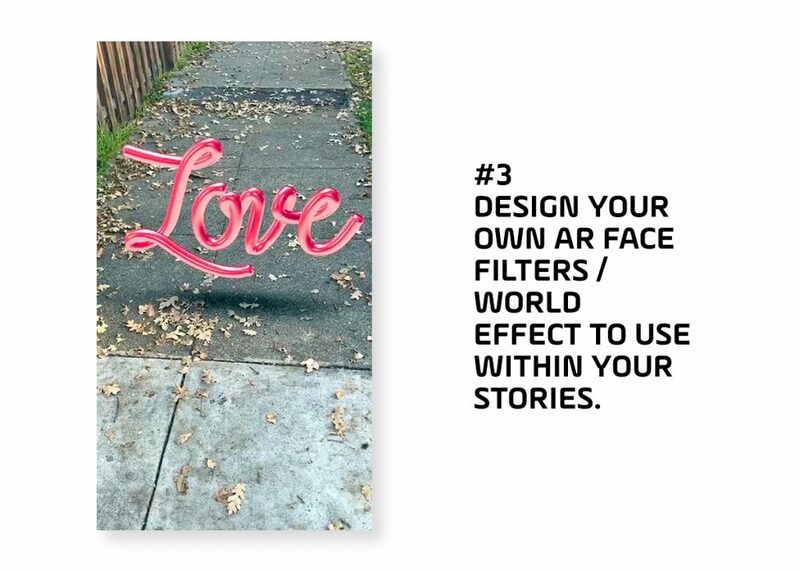 Now brands and individuals alike can use Facebook's AR Camera Platform to create their own 3D effects that can be used in Instagram. You will only be able to use the custom filters that brands and individuals create, if you follow them, marketing opportunity anyone? 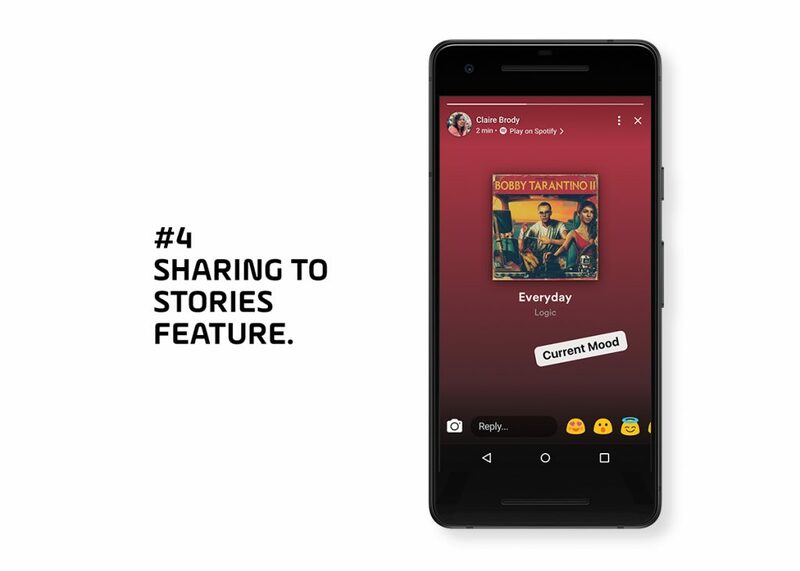 This feature will actually be available on both the Instagram and Facebook platform and will allow you to share a sticker of the Spotify song your listening to directly in your story. The sticker then becomes deep link to the Spotify app allowing your followers to listen to the song via their account with ease. In addition to Spotify, users will be able to share their GoPro footage as well. One can only presume that more integrations like this will come in the future. 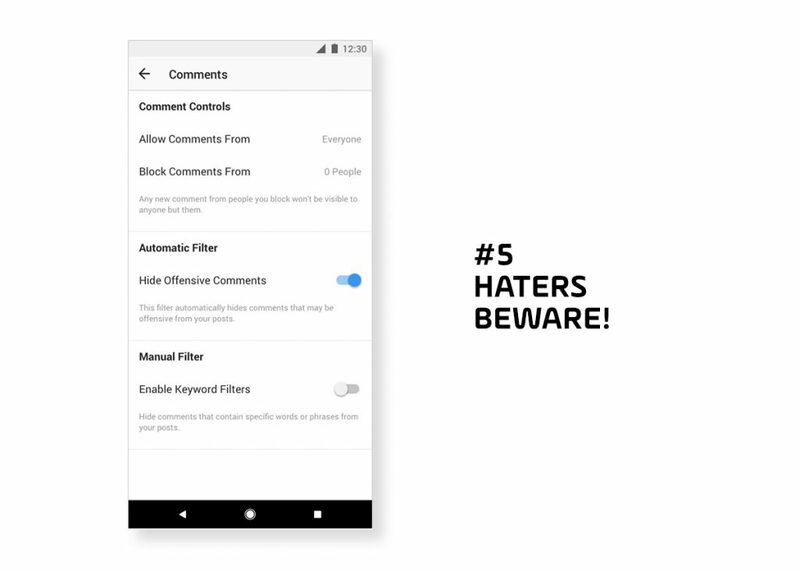 Instagram is now filtering out bullying comments. According to Instagram, the new anti-bullying feature uses machine learning to identify language that’s intended to harass or upset people. When this type of language is identified, the offensive comment will automatically be removed. Users will be able to enable or disable this feature from settings page. That’s it for now and you can catch the full F8 Keynote here.